Tonight's Thursday Night Livestream went off with out a hitch, only oad 3 or 4 people the whole time but hey, really appreciate having them there! 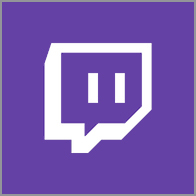 A little note to folks not aware but the new livestream setup does not let me record, so if you miss a live stream event you miss it. No recap for later :) Just for your info for future streams. Luckily I take some screenshots along the way cause I find the process interesting and useful to go back and study for future work. So enjoy the recap below, a free-style redesign of the client's OC 'Terrific Girl'. 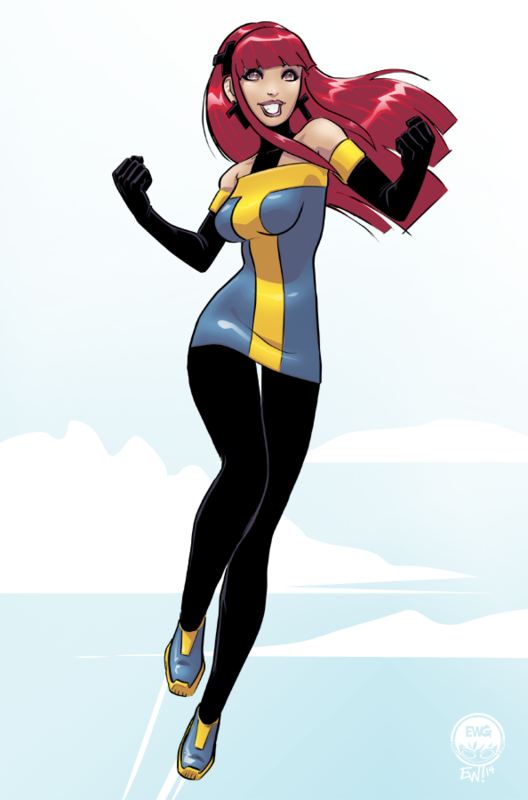 Before she was a yellow, red and blue goody-two-shoes heroine resembling classic mary marvel or ms. marvel. Which is good adn I wanted to keep the peppy good girl goody two shoes aspect. But I think what I ended up doing was going in a powerpuff girl direction all while stream lining the T logo and her outfit. I dig it and hope you do too! Enjoy the steps below! 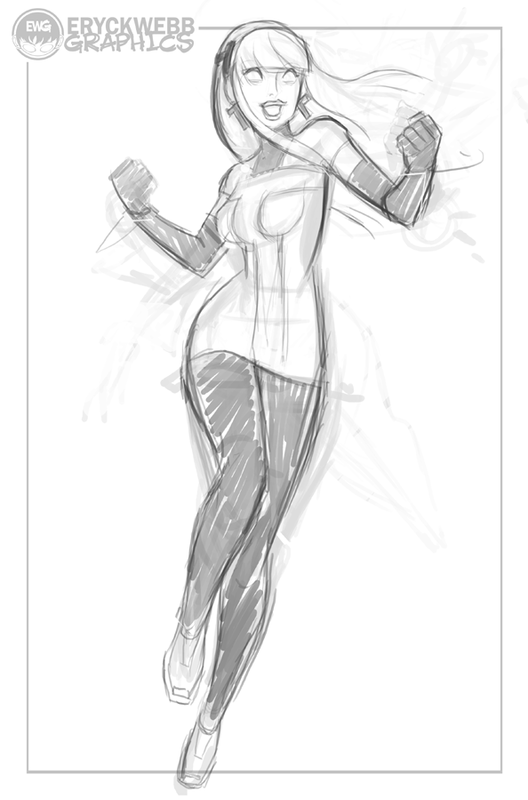 The tight pencil sketch as far as I wanted to take it knowing I was going to be inking it. So in this case I left alot of the final refinement and details to the inking stage. Since this was a one-off free-style design (aka no advanced designing and changing) and the client was in the chat watching, I took an extra min and slapped some color design on the character. The character was originaly brunette, but I had blonde in mind when designing her that plays off the yellow of the costume well. I liked the red too and even worked back in red into the costume from the original design. Where in the other two I dropped the red completely and added in black (which was not on the old design). We went for the costume with no red, and though leaning towards red hair color waited to the final color stage to make the decision. But the costume/ design were all OK'd be the client. Popped the pencils into Inkscape and inked up the character. This time playing with a slightly different style of tracing out the contours in most areas but no interior detail lines. Most noteably on the body, legs, hair and arms. 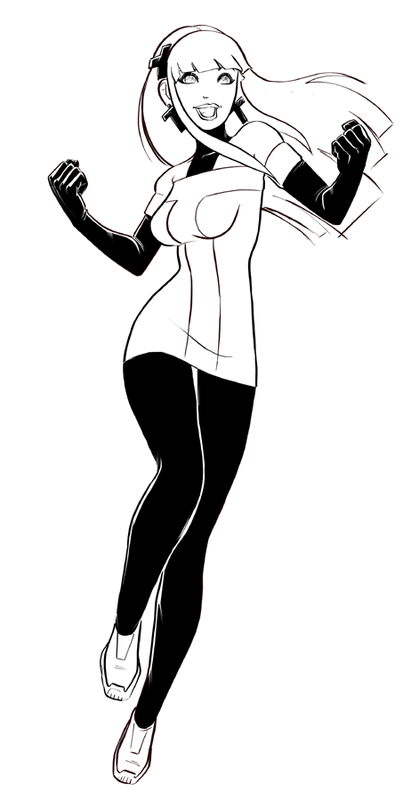 Then once inked, tossed it back into photoshop. Heres the flat colors, with the brightness turned way down. I do anymore like to do highlights working from darker color lighting. Brings out nicer highlights. And then accent them with some shades. But at this point layed down all the colors. And then had gone through some color options for the hair but the client decided red looked best, and I agree. Finaly, shades, highlights and background gradients were applied. As well as color balance and additional spot highlights. And shes all done! Go Terrific Girl go! Hope you enjoyed this step by step breakdown of the process from tonights digital character art demonstration and see you out next Thursday 830pmEST for the next EWG Livestream! Comments or questions about the process and steps? Comment below!